When you perform email marketing, you will be sending out large quantities of emails to perhaps thousands of recipients. Doing this in a normal email client like Microsoft Outlook is a very tedious process. That’s why most people will either use an email blaster program or engage the services of Email Sending Providers for a fee. Here, we will show you a simple VB.NET commandline program to blast out emails. 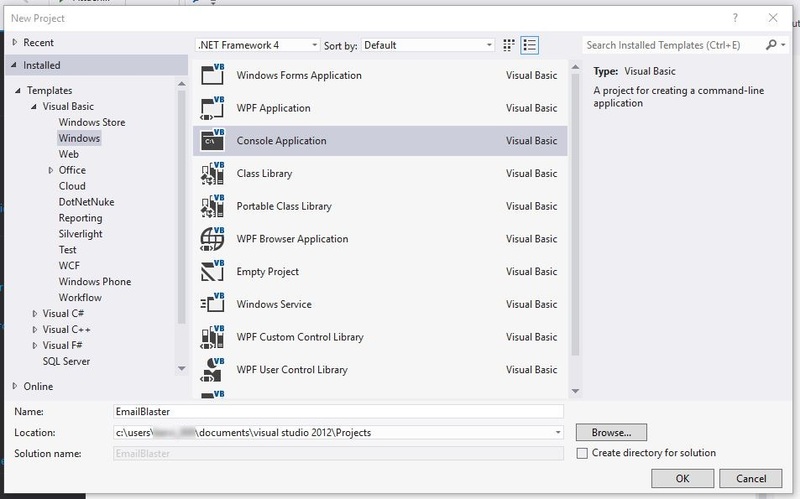 You will need have a basic understanding of the VB.NET programming language and you should also have Microsoft Visual Studio 2012 or later installed on your computer. For the mailing list recipients, create a text file called emails.txt and write one recipient email address per line. As for the email template, create a text file called template.txt and in this file, the first line will be the email subject. The rest of the lines are considered to be the email content. Open Visual Studio and click New Project. Under Templates > Visual Basic > Windows, select Console Application. Name your project EmailBlaster and then click OK.
Once your project has been created, you will see a file called Module1.vb. Edit that file and paste the following code in it. Remember to modify the code for your own settings. emailfile should contain the full path to the emails.txt file. templatefile should contain the full path to the template.txt file. fromname is the name of the sender, meaning your name. fromemail is the email address of the sender, meaning your email address. smtpusername is the username you use to login to the SMTP server. smtppassword is the password you use to login to the SMTP server. smtpserver is your smtp server hostname. smtpport is the port which is used to connect to the SMTP server. smtpssl should be set to True if your SMTP server requires SSL connections. Once you are done editing the file, you can just compile the codes to create the commandline program. Dim emailfile As String = "C:\path_to_this_file\emails.txt"
Dim templatefile As String = "C:\path_to_this_file\template.txt"
Dim fromname As String = "my_name"
Dim fromemail As String = "my_email_address"
Dim smtpusername As String = "my_username"
Dim smtppassword As String = "my_password"
Dim smtpserver As String = "my_smtp_server"
Your compiled program should be called EmailBlaster.exe. To start sending emails, just run the program on the commandline.